A huge array of Personal Weather Stations is what makes Weather Underground (aka WUnderground) be so much more precise than any other weather service. In fact, the company’s forecasts are so precise (and cheap? ), that “even” Google chose them to be their primary source for searches and other weather related cloud services (i.e. 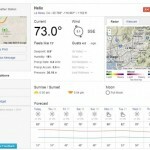 see http://www.google.com/intl/en/help/features_list.html#weather). But while there are “more than 25,000 weather stations across the globe [that] already send data to Weather Underground“, there are still many areas of the world that are not properly covered by this extensive network. In my case the topography of the region is so extreme, that the nearest station was constantly off by up to 15 degrees. Needless to say, even the next day forecasts were all over the place. 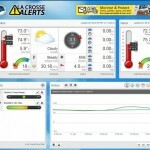 Introducing (cheap consumer grade) La Crosse Technology Wireless Weather Station with La Crosse Alerts (aka C84612) being sold at offline Costco stores. The station costs roughly $80 and comes with wireless wind (speed, gust, direction), rain (still not working for me), temperature, humidity, and pressure sensors, as well as a mediocre dashboard panel, and an “ internet gateway” (connects the panel to La Crosse propitiatory website). This station is capable of properly reporting current information in close to real-time onto the dashboard and roughly every 20 minutes to the attractive La Crosse Alerts secured website. Note: The alert service provided by La Crosse, which pushes the information onto their website, is essentially a trial. Once it expires, the service (currently) costs just under $12 per year. An acceptable price, I would say. Unfortunately, our luck stops there- the site boasts responsiveness and accessibility, but the “forecast” portion is most definitely nothing more than a barometric pressure check, aka 17th century weather science. This is far from all of the awesome information you can get from WUnderground, and the need to log-in via browser each time just to check weather kills even the current condition aspect of the offering. Fortunately, we have our web box (a VPS droplet courtesy of DigitalOcean, of course) that is just itching to connect and marry the two for our enjoyment- La Crosse (propitiatory) website and Wunderground Personal Weather Station (not-so-documented) API. I’ve devised a quick PHP script that connects to La Crosse Alerts, logs-in and, using the same session, downloads the data, parses it, and then pushes it over to Wunderground. Please feel free to reuse and let me know if it has been of help for you as well. The La Crosse website data was not officially designed for scrubbing, hence the structure could potentially change. It is unlikely that the change would occur any time soon, especially since the format appears to be generally similar to that of open-weather, however they could deem this type of connection detrimental to their service/offering (??!!) and a breach of the TOS (??!! ), leading to eventual block of the script. Please try to not abuse their system! As both website fluctuate at times, the error handling is set such that it does not send back the output unless it’s been some time (configurable) since the last scrub and/or upload of data. I also had to do some additional recalculating since the La Crosse wind gauge cannot be adjusted once hoisted in place. Who knows what else I will add to this over time (perhaps non-recurring error notification control and consistent session and connection control? ), but for now, I recommend you do try it out for yourself. Reconfiguring it for your own station and setting it up on cron (with MAILTO to email on any output (errors)) takes only a few minutes- try it out and let me know! Note: Wunderground PWS API uses non-secured pushes- they are not only basic HTTP, they are, in fact, all GET based. This puts your password at risk (albeit username is not used)- consider changing it to something basic or using a secondary login for authorizing PWS updates.